It may seem like lenders create your credit score out of thin air to decide whether to approve or deny you credit. The reality is there are a mix of factors that go into the number, some of which you can control and some you cannot. One of the most important credit score factors, and one over which you have complete control, is your credit utilization ratio. Yeah, it’s not the most easily understandable name. I don’t know if it’s a plot by the credit card companies or just a crappy name but the actual idea of credit utilization is much easier. It’s just the amount of money you’ve borrowed on credit versus the total amount you have available. Understand how your credit utilization is calculated and how it’s used in your credit score to help improve your FICO and get the money you need. The credit utilization ratio may be at once one of the simplest ideas in debt management and also the least understood. Looking at the words individually makes it a lot easier to understand. A ratio is just a percentage, so 5 out of 10 would be a 50% ratio. Utilization is another word for usage. Not sure why the credit score geniuses couldn’t just say that, maybe because they don’t want you understanding the terms? Credit…well, you know what that means. Debt. So the credit utilization ratio is just a percentage of debt you use! The total debt you owe on credit cards and other loans is compared to your limit or available credit on the loans. For example, if you owe $5,000 on a credit card with a limit of $15,000 then your credit utilization ratio is 33% or ($5,000 divided by $15,000). It’s your total credit utilization ratio that affects your FICO credit score and is a big factor in whether you get a loan and for what rate. 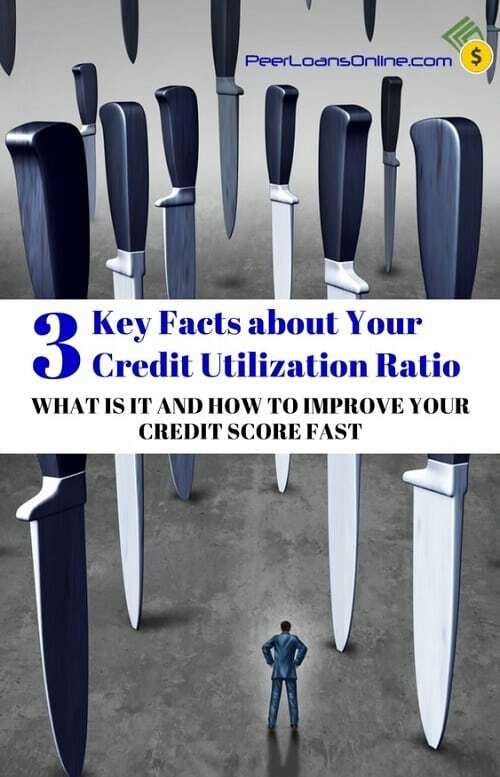 How Does the Credit Utilization Ratio Affect Your FICO Score? The Fair, Isaac and Company (FICO) developed a way to use all your credit history to assign a score in 1956. It’s a score between 300 and 850 that lenders use to determine whether to give you a loan and what to charge you in interest. 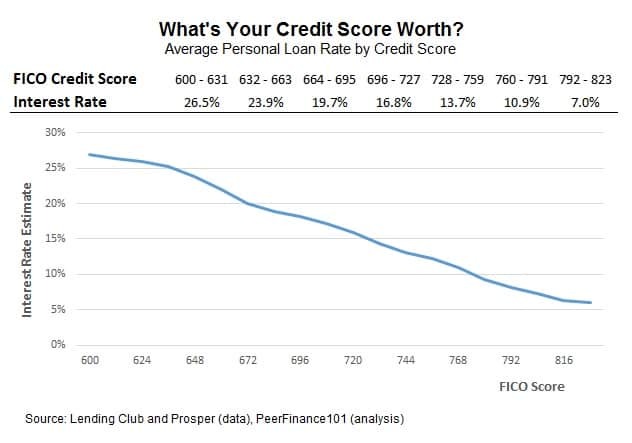 That FICO score is determined by five factors and your credit utilization ratio plays a big part in one of them. Your payment history is pretty much set in stone. You can resolve to make on-time payments in the future to improve it but what’s in the past is done. The total amount owed is a big chunk of your score and is that credit utilization ratio. Lenders are going to look at the total amount you owe, is it very high compared to your stated income, as well as how much credit you have available. If your credit utilization ratio is extremely high, meaning you’ve almost maxed out your card limits, then it may be a sign that you’re getting in over your head. That’s a bad sign and lenders will charge you higher rates for the risk. I pulled data on peer lending loan rates by credit score to see just how much a bad credit score affects interest rates. At the high end, borrowers enjoy rates of 7% on loans but that rate quickly jumps into the double-digits for lower credit scores. With the credit utilization ratio, lower is better and zero is best. Most lenders recommend keeping it under 30% for each card and for your total credit profile. The idea is often confused with another concept, the debt-to-income ratio or just DTI. Both of these are ratios so they are both percentages and pertain to debt management. Again, it’s easiest to look at the individual words. The debt-to-INCOME ratio measures how much debt you have against your income. Your income isn’t in your credit report but lenders will ask for it on a loan application. The DTI shows how much of your monthly income you owe to debt payments. Besides debt payments, it also includes other obligations like rent, child support and alimony. For example, if your monthly debt payments sum up to $1,000 and you make $4,000 a month then you have a DTI of 25% of your monthly income. While the credit utilization ratio is used in your credit score, the DTI is not but is just as important when getting a loan. Lenders want to make sure you have room in your budget for adding payments on their loan. If you already have a high DTI then you might be getting dangerously close to not being able to make payments if you add another loan. Most mortgage lenders have a strict cutoff for DTI, around 30% and won’t budge on the rule. Understanding your credit utilization ratio is just the first step to better credit. Now you know that lowering your ratio will improve your credit score and could mean lower rates on new loans. Try keeping your utilization ratio below 30% but plan a few months ahead before applying for new loans. If you can raise some money to pay down your debts then you’ll lower your ratio and can save hundreds on interest. Credit card companies report your credit utilization to credit report agencies at different times during the month so it’s best to give this trick a couple of months or more to work before applying for a loan. The credit utilization ratio doesn’t have to be a mysterious or confusing subject. Understanding what it means to your credit score and how you can control it could mean lower rates on loans and a brighter financial future.